Provides in-memory storage employing First-In-First-Out (FIFO) replacement policy. Definition at line 35 of file in-memory-storage-fifo.hpp. Definition at line 26 of file in-memory-storage-fifo.cpp. 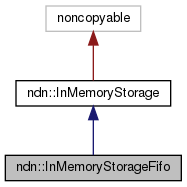 Definition at line 31 of file in-memory-storage-fifo.cpp. Definition at line 37 of file in-memory-storage-fifo.cpp. Definition at line 57 of file in-memory-storage-fifo.cpp. Definition at line 49 of file in-memory-storage-fifo.hpp.